Melbourne artist Stephen Garrett’s strategy is to work directly with the gallery space. Timing and not just time is indeed the essence of his project for he is haunted by memories of suicides. 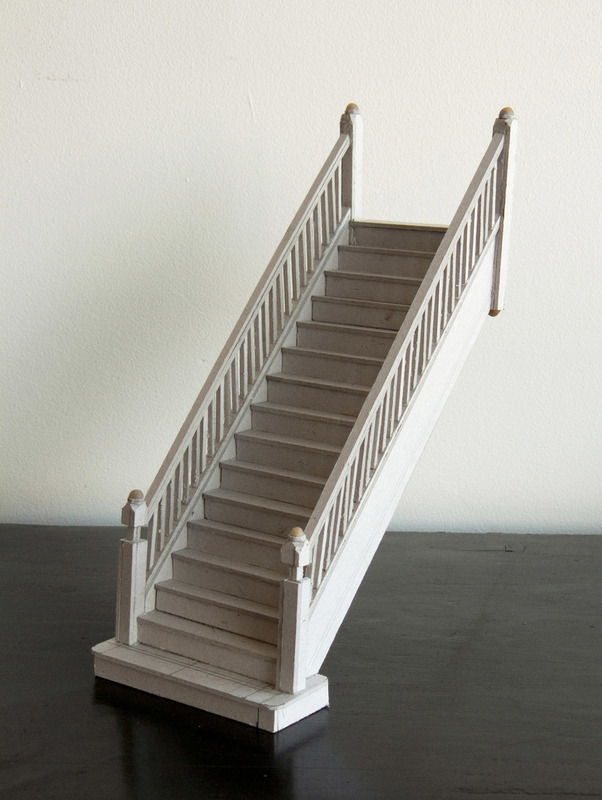 In the fetishistic invocatory manner of Robert Gober he fabricates familiar objects according to closely observed simulacral demands so that even his maquettes are at once in and out of lived chronology. His concerns are primarily phenomenological. The monkey bars are retrieved from childhood memory as those upon which a neighbour anchored a rope and then attached it to his neck. The wardrobe is that in which a family friend hanged herself. It is as if these miniatures have the power to talismanically gather lost life-force and somehow recathect it – restored or doubly dead? – back into living space. Susan Stewart has noted the miniature’s zombie capacity to “bring historical events “to life,” to immediacy, and thereby to erase their history, to lose us within their presentness.”  Such force is a simultaneously productive and unproductive transcendence. “A house within a house, the dollhouse not only presents the house’s articulation, of the tension between inner and outer spheres: she writes, “it also represents the tensions between two modes of interiority”. Garrett similarly proposes, in the form of a physicalized wonderment/bewilderment, what happens when we insert one staircase inside another, especially when the banisters are considered yet another secure anchorage for the suicide’s noose. In effect the object internally displaces itself and thus is pathologically parasited by performing as its own doppelganger. In the same way, and this is a truly shocking thought, and suitable endnote, the suicide internally self-duplicates so that one self can efficiently dispatch the other, without any residual and thus existential overlap. Enter then the vast chamber of little horrors: the fatal inside of fragile subjectivity: what art can only ever hope to secure. The term “spectral evidence” comes from the title of Ulrich Baer’s study: Spectral Evidence: The Photography of Trauma, MIT Press: Cambridge, 2005. Elaine Scarry, The Body in Pain, Oxford University Press: Oxford, 1985, p. 8. Susan Stewart, On Longing: Narratives of the Miniature, The Gigantic, The Souvenir, The Collection, Duke: Durham and London, 1993, p. 60.